I have been getting a lot of requests from people to expand upon the pencil portrait lessons and start working on the full body instead of just the face. I have been blessed with the friendship of an amazing woman that has agreed to, not only be my model, but to co-write my next book with me. The book will cover as many aspects of drawing the female form realistically as possible. To that end, I would really like to hear from you. What would you like to see in this book? What areas do you have problems with that you would like to see us cover? We are just getting started with the art for this book and have done very little writing at this point. But we have done an amazing photo shoot that I'm sure you will absolutely love as reference material for your own learning. Over the next few weeks, as we begin work on the book, we will be posting a series of lessons that will deal with a bit more than just the face. 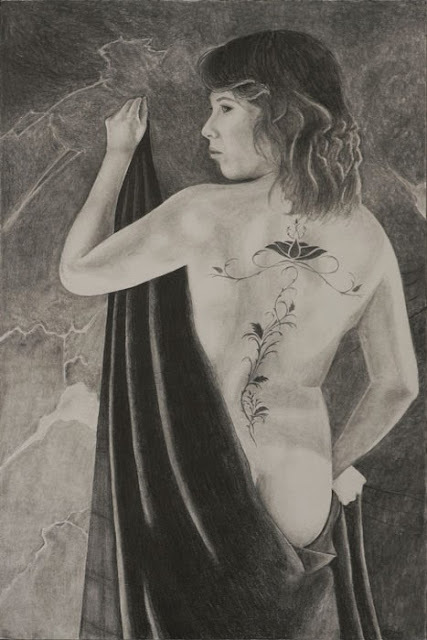 The photo we have chosen for this lesson includes muscle definition in the back, dramatic lighting, Tattoos, fabric and a texture for the background. The following image is what we will be using for this project. Strathmore Bristol smooth 100 lb stock 11 x 14. If you have any questions regarding any of the tools please see the lesson entitled The Right Tools. I choose to work with Strathmore Bristol smooth 100 lb stock because I like to get as smooth of a surface as possible in order to get a nice even blend with the shading. But here is a little tip for getting an even smoother surface. The face of the paper is designed with a certain texture specific for certain artistic needs. But if you turn the paper over and use the back side, you will find that it is even smoother still. Once the tools have been gathered you have to create your initial sketch. I go over several methods of doing this in a previous tutorial called Creating the Initial Sketch. The method that you choose is entirely up to you and what you are comfortable with. As in previous lessons, we are working from a photograph instead of creating a figure out of nothing. So make the best use you can out of the reference available. 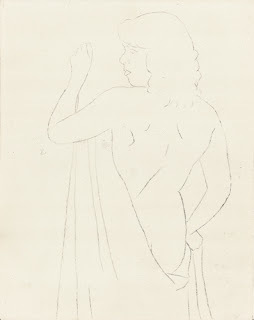 Below is a scan of my initial sketch. Please note that the lines you see here are a lot darker than what is actually on my paper. You can barely see what is on my paper so I had to enhance the image a great deal in order to show it to you. Remember that you will be erasing or drawing over all of these lines as you progress so you want them very light and easy to erase. 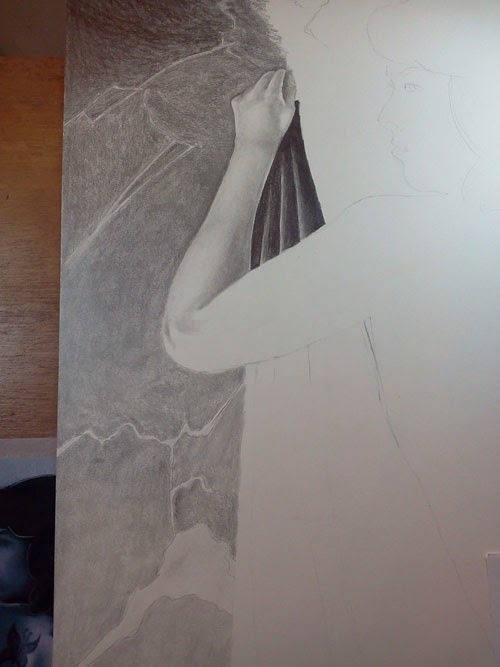 Also, if you put too much pressure with the pencil on your initial sketch you will cause indentations in the paper. 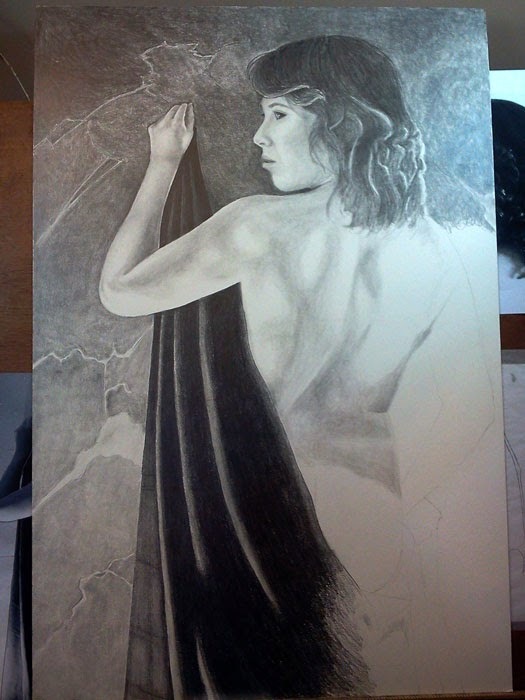 If you need to blend over those indentations (as will be done with the definitions in her back and with the draping) you will end up with very unpleasant lines where the graphite is having to work over them. As you can see, I only sketched out the roughest of details in order to use as a guideline for the rest of the work. At this point I have some decisions to make. Mainly in what order to work on the various elements. Most likely I will start with the face because it is most important for detail. If the face does not work correctly then the entire project will look wrong and I will have to start over. From there I will move to her body, likely starting with her left hand and making my way towards the right. Since I am right handing, this will lessen the chances of my hand damaging work I have already done. 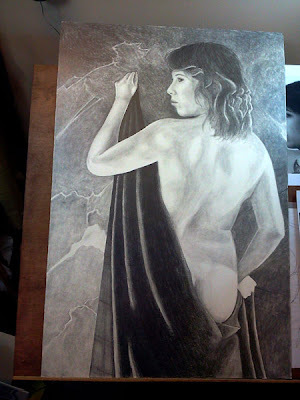 Then I will work on the wall behind her. This is going to take a lot more work that you might imagine because of the texture detail. If done incorrectly it could look flat and boring or it could be way too exaggerated and completely take away from the beauty of the subject. 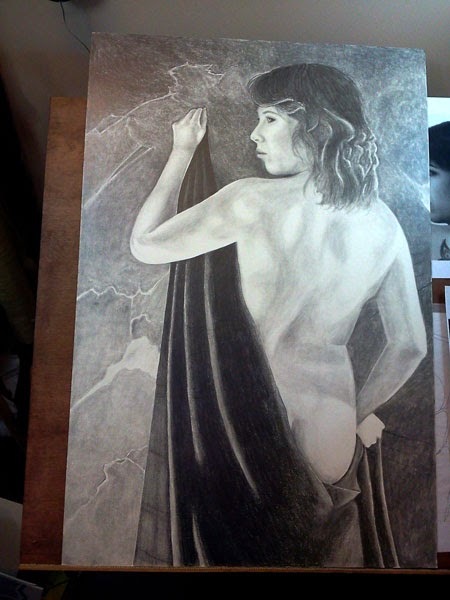 We want the viewer's eye to be drawn to her, not the background. 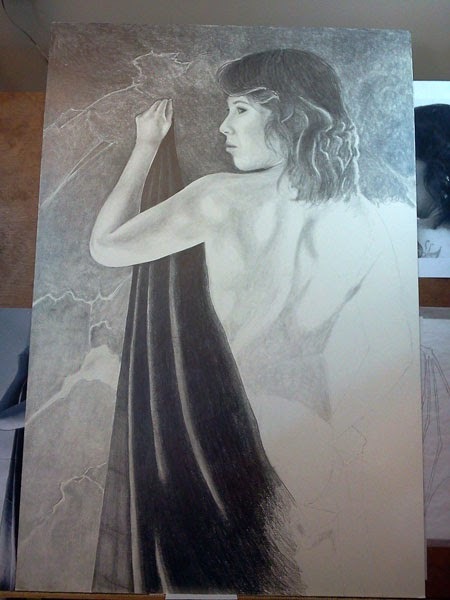 Finally we will work on the fabric and hair. 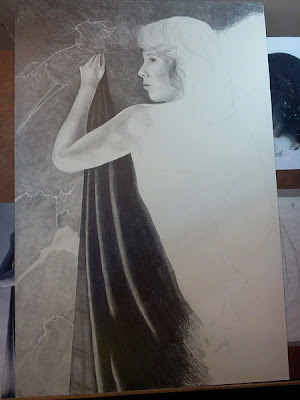 I want to leave the darkest areas for last because using that much graphite can get very messy if you aren't careful, plus there is a technique to getting a darker coverage but in order to do that, the rest of the image needs to be complete. That's it for now. Mull over what I have said here. 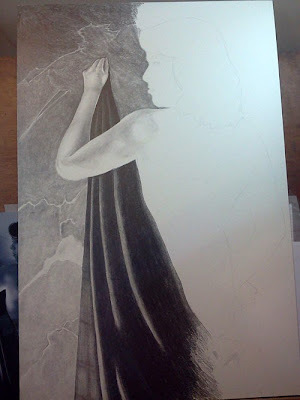 Work on getting you supplies together and creating your initial sketch. I will be back in a few days to talk about the next step.